Ross Gay is an American poet and professor. “Not Perfect Things," an Interview with Ross Gay. This interview was conducted via e-mail by Interview Editor Nicholas Femiano. Of the process he said, “Ross Gay’s newest collection, Catalog of Unabashed Gratitude, is a refreshing change of pace in world that seems so filled with pessimism. 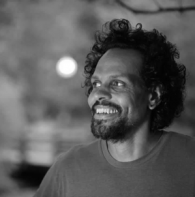 I can’t remember the last time I read something like this that made me feel thankful just for being alive.” In this interview Ross Gay talks about the importance of gratitude, his experience teaching poetry, and his childhood friendship with a mulberry tree. Superstition Review: First, I want to say, I really like your style. The way you move seamlessly through multiple thoughts in one fluid stream of consciousness is something to admire. Your latest collection, Catalog of Unabashed Gratitude, certainly showcases that. How did you arrive at this particular style for this collection, and how is it (or isn’t it) indicative of your personality? Ross Gay: Oh I’m not real sure. While writing these poems I was reading poets who do some of that, like Eileen Myles and Mary Rueffle and Pablo Neruda, and that’s a real thing. I think I might be sort of self-interruptive, and I might be kind of digressive, so maybe those poems are kind of like me in some ways. SR: One of my favorite aspects of this collection is how you are so intimately involved with the nature you cultivate. It’s bold and messy in the best of ways. How did you first develop this kind of connection with nature? RG: You know, the more I think of it, despite what I have for years been telling myself, I grew up with a pretty significant relationship to “nature”—what isn’t nature?” is what those quotation marks are asking, I think, which is to say, even if I’m not growing a garden or walking in the woods, “nature” is being connected to—I spent a bunch of time in the woods behind our apartments, and in the trails—we called them “the trails”—behind our apartment, and we had a big mulberry tree, and I spent hours harvesting wild raspberries behind the school, and once we found a concord grape vine in the woods so heavy with fruit, growing way up into a tree while also making a kind of hut we sat under and stuffed ourselves until we turned the color of grapes. That grapevine has a mythical quality for me, I can tell, reading what I just wrote. I’ve been searching for it, and probably the little gathering under the hut of its vines and leaves, since that day. SR: In the poem that shares the same title as the collection, you write in gratitude to a nameless ancestor, “who loved you/before she knew you by not slaughtering/the land.” Can you talk a little more about the idea of loving future generations by preserving the environment? RG: I think your question answers itself. We love future generations by preserving the environment. We will make it possible (or, not impossible) for them to live. And the love is extended to everything I think—we love future generations by loving the water and air and violets coming up right now. By loving we love. SR: In the poem “to my best friend’s big sister” you write about shameful experiences, “stitched together like a quilt.” Can you further explain the significance of the quilt of shame being “held up/to the light." RG: Well, I kind of read it like a thing we can observe, shame, which can be a pretty organizing thing in a person’s life (I’m speaking for this person), and once we observe it, if we’re so lucky, we might be able to, well, observe it, and maybe even put it away, what we’re able to observe, as opposed to being made of it. SR: How has your experience teaching poetry in a university setting shaped your own writing? How has your work as a professor informed your poetry? RG: Oh I bet in so many ways I don’t even know. I know the first thing is that I am regularly around truly brilliant and trying individuals who love language and poems and are making beautiful things. That is inspiring, and I love to be around it. And the conversations I have with students always stirs in me things that become things that become poems or essays or this and that. Or just stir in me delight or some awakening, you know. (Sometimes we just talk about scheduling or something too.) I also am very close friends with some former students, and I write a lot about friendship, or community, so in my teaching I think—I know—I am studying community. And my study of community through my teaching has made me, surely, more curious about and committed to writing a poem that is also part of that study or inquiry. I could go on. SR: Catalog of Unabashed Gratitude is your fifth poetry collection. How has your writing process changed since your first publication? How has your vision as a poet evolved over the years? RG: I think maybe I’m more interested in making not perfect things, making things that are artifacts of an attempt rather than something else. I’m very uninterested in mastery, and I think probably I used to be more interested in it. SR: I notice you begin some of your poems with an address to your readers, even calling them your friends. What is your reason for implementing this technique? RG: I think I want to get close to the reader. I want to dramatize the desire to get close to the reader. To remind the reader that someone wrote this poem with the desire to actually talk to you, dear reader. SR: What is the importance of oral performance when it comes to the transmission of your poetry? RG: It’s pretty important to me. I think bodies are incredibly interesting. A poetry reading feels so dramatic, no matter what, because this person before you will not always be here. You know, when we read, we are changing, before an audience’s eyes. Which is a good reminder, I think. SR: What is the biggest impression you would like to make on your readers in regard to the art and practice of having unabashed gratitude? In what sense are people today in need of a more Whitmanesque outlook of the world? RG: I am interested in joy. Gratitude, connecting to our connection, our interdependence, celebrating that, makes my life more interesting, more worth living. I have a strong hunch studying our connections, our necessity to each other, our inter-dependence, might make our lives more possible. RG: I don’t have a designated writing space. I don’t know if I would actually like that. I spent a lot of time dreaming of building a little writing shed, looking at those pretty books with all the writers' writing sheds, and picturing mine, and the desk I was gonna build, then I remembered I never write on a desk. Like, ever. So, nope. Nothing special. Sometimes I like to go to a place in Bloomington called Uel Zing that has wonderful coffee and good music. That’s a good place to get some stuff done, it’s nice and quiet, and it’s about four blocks from my house. But I write most anywhere. Well…maybe anywhere not my house. I don’t actually write much where I live. Something about being outside, maybe. Also, Procrastination is one of my favorite writing spaces. If I have other obligations I often go to Procrastination. Or Procrastination comes to me. It’s amazing. Such comfy couches. And really good light.